BOSTON — Learn what the elite pros had to say at today’s press conference. Well at least those that we could catch up with (Boston has all of the elites come through in a a one-hour period and some of them, such as Olympic champ Tiki Gelana, weren’t present). 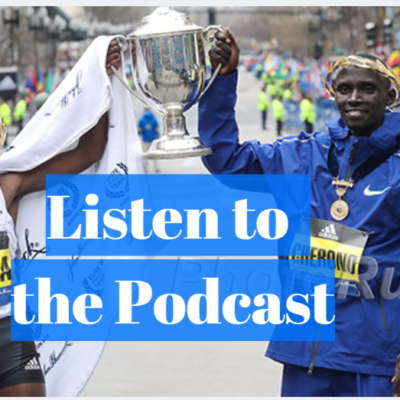 We also caught up with Wesley Korir (a Kenyan Member of Parliament and the 2012 Boston champ) and he told us all about the anti-doping bill he’s sponsoring in Kenya. You can read that in a separate article here. Several top Americans of the past and present (including 2016 Olympians Amy Cragg and Desi Linden plus Ryan Hall) were on hand as well, and you can watch/read about our interviews with them here. Chepkirui said she’s hoping to take first or second this year after finishing a disappointing 10th in her Boston debut in 2015. Since then, she’s won marathons in Amsterdam and Honolulu and said she’s “changed everything” from her 2015 Boston buildup, running on hilly courses in Kaptagat rather than the flat courses she trained on last year. We asked whether Chepkirui thought if Huddle should have been DQ’d, but, but she didn’t say. “I think maybe she pushed me a little bit,” Chepkirui said, adding that she believes she would have won had Huddle not made contact. Overall, though, Chepkirui has moved on. Two-time champion Lelisa Desisa seemed very worried when we told him it might be warm on Monday. When we first chatted with the two-time champ, we encountered a very confident Lelisa Desisa. He said that his training this year has been better than in 2013 and 2015 when he won here as he’s not doubling back from Dubai. Just when we were getting ready to anoint him as our pick for the win, we told him the weather forecast for Monday was for some warm weather and asked whether that concerned him. “Hot, I don’t like,” said Desisa, who was only 7th in the heat of Beijing at the World Champs last August. We spent a good 10 minutes looking up a detailed weather report for Boston on our computer and trying to convert the forecast to Celsius for Desisa and his agent. Weather.com’s hour-by-hour forecast isn’t out yet but it’s likely to be in the 50s at the start and 60s during much of the elite race so we told Desisa it was likely to be 18 Celsius (64.4 Fahrenheit) and that seemed make him feel a little bit better as it’s not likely to be a total scorcher. So the takeaway from our talking to Desisa is that his training has gone very well (which is a good sign as he ran 60:37 in Houston in January) but that the hotter it is, the less likely he is to win. Rotich’s coach Ryan Bolton us told us before we got here that Rotich was both “physically” and “mentally” feeling good and thus she should be “ready to roll.” In talking with her today, we’d say she certainly gave us a very similar vibe. “I feeling good and excited to be back in Boston,” said Rotich. We then asked her if she was worried as she ran 70:45 this year at the United Airlines NYC Half Marathon versus 69:53 last year, and she said she wasn’t. Rotich is clearly hoping to defend her title. We asked Rotich what it’s like mentally to come back as the defending champ. As a runner, most marathoners dream of winning a major and Rotich finally achieved that goal last year in the marathon of her career. We were curious as to how that win impacted her mentally. Did she still have the same drive or does one rest on their laurels a bit? “It’s more motivating. You want to do it again,” said Rotich. 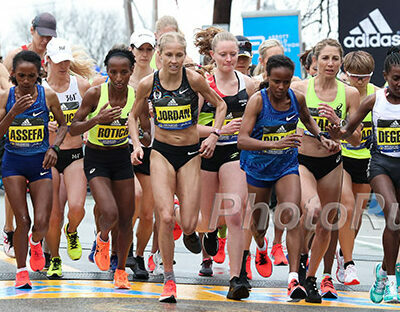 We pointed out in our women’s race preview that Buzenesh Deba, the unofficial course record holder in Boston at 2:19:59 (only doper Rita Jeptoo has run faster), has struggled in many of her races of late but not in Boston. 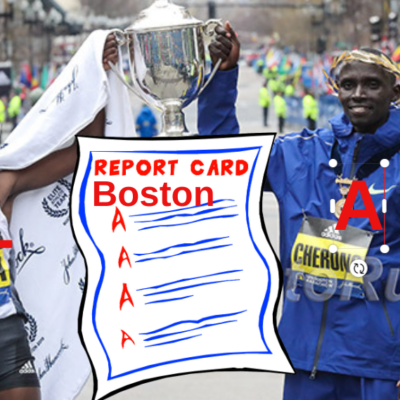 Clearly, Deba will want to get back on track with a strong showing in Boston this year. However, in her lone prep race for Boston, Deba only ran 74:39 at the United Airlines NYC Half. When we asked her if that was indicative of her training, Deba said she didn’t think it was as she explained that she ran 20 miles the Monday before the race and 16 miles two days later (Wednesday) so she was feeling tired in that race. But when we asked her how she’d do on Monday here in Boston, Deba was honest. “I don’t know – we’ll see. After my injury, my training hasn’t been the same,” said Deba, who then explained she had a left knee injury related to her IT band last year during her buildup for New York. The good news for Deba and her fans is she says the injury is now a thing of the past. “Now I’m good,” said Deba, who spends the winter in Albuquerque and the rest of the year in New York. That being said, Deba said she wouldn’t be going out at a crazy fast pace. She said if the race is like “Shalane in 2014” when Deba ended up being running 2:19:59 for second thanks in large part to Shalane Flangan going out crazy fast, Deba said she’d stay back and run with the chase pack. When we asked her about the potential of hot weather, Deba indicated she likes hot weather and would welcome a hot day. 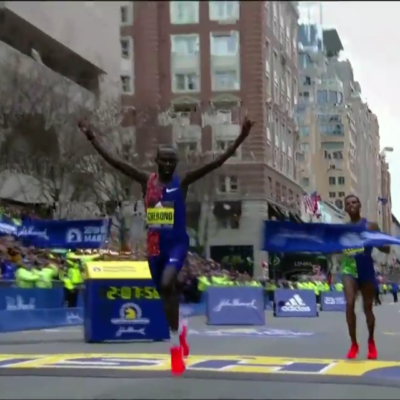 Chebet, who was second to Meb Keflezighi in 2014 and third last year, said that he’s changed his training a little bit from past years in order to claim his first victory in Boston. He’s been doing his training at higher altitude and running tougher routes, which he believes will better prepare him for Boston’s undulating course. Chebet finished second at the NYC Half last month in 61:35, which he thought was an okay performance, though he said he could have run much faster (his PR is 59:15) had it not been so cold. “If the weather goes well [on Monday], I think I will do something good,” Chebet said. Chebet was seated next to Kitwara during the media availability and the two men, who train together in Kaptagat (their wives also hail from the same hometown and are friends), were hamming it up in between interviews. Kitwara has run well at several majors recently. He was 6th in London last year, 3rd in Tokyo in 2014 and has finished in the top four in Chicago in each of the past four years. Kitwara has always wanted to run Boston, and after failing to win elsewhere, he decided to give the historic race a shot. Kitwara’s buildup has gone well — he ran 59:47 to win the Lisbon Half Marathon last month — so he’ll certainly be among the contenders in Boston. One other note: Kitwara trains in Kaptagat, the training base of many of Kenya’s top distance runners, including Geoffrey Kamworor and Eliud Kipchoge. However, he doesn’t work out with them (they’ll usually get together after runs and chat instead). In a bit of symbolism, Kitwara usually sees Kamworor running one way on the road as he’s going the other direction, reflecting their different goals. We talked to Mekonnen and his coach Gemedu Dedefo, who shined a light on some of Mekonnen’s recent struggles. The 20-year-old Ethiopian burst onto the scene with a 2:04:32 win in his debut in Dubai in 2014 and added a 5th in London later that year. But after that, Mekonnen DNF’d three straight marathons, all for different reasons. In Frankfurt in October 2014, Dedefo said Mekonnen fell down midway through the race and injured his knee. In London the following spring, Mekonnen arrived with a headache, and though he received medication for it after going to three separate hospitals in London, the headache returned 25 kilometers into the race, causing him to drop out. In Amsterdam last fall, Mekonnen dropped out due to a hamstring injury. Mekonnen returned to form with a third in Dubai in January (2:04:46), a result that brought a big smile to Dedefo’s face, and both athlete and coach are hoping for something similar in Boston. Dedefo said that Mekonnen can’t control how he feels on race day but that training has gone pretty well for the most part, apart from some calf pain three weeks ago that caused him to miss two days of training. Berhanu has plenty of reasons to be confident as he proved last year he can recover from Dubai and run well again quickly as after winning Dubai he also won in Warsaw last April. As for being ready for Boston, which is a lot different than the pancake-flat Dubai course, Berhanu, who trains with World championship silver medallist Yemane Tsegay, said he trains on hills in Ethiopia and also trained in different temperatures as well. Simon Rotelli of his management company also reiterated that Berhanu’s training has gone well and added that the Warsaw course had a lot of turns so he’s confident that he’ll be able to handle a changing pace, which doesn’t really take place in Dubai. When we asked if a win on Monday was a realistic goal, Berhanu replied with a confident nod and grin. When asked Berhanu if he was actually 21, he grinned once again and said he was 21. Daniel has had a success at a number of marathons (2013 Vienna/Toronto champ; 2014 Paris/Commonwealth Games champ) and but she’s never before raced in the United States — until now. The 32-year-old is being cautious and clearly respects the course — when we first asked her what her goal was, she said simply “to finish” — but eventually reset her goal to finishing on the podium. She is excited to be running her first Boston after her friend Sharon Cherop, the 2012 Boston champ, recommended the race to her. Entering last fall’s Eindhoven marathon, Stephen Chebogut was a 30-year-old Kenyan marathoner with a 2:08:02 pb that dated to 2011. Now he’s the reigning Eindhoven champ with a 2:05:52 pb. When we asked him what was responsible for the huge improvement, Chebogut said it was hard work. He said he used to run twice a day but now runs three times a day (sunrise, 10 a.m. and then 4 p.m.). Since finishing third at Tokyo in 2014, Michael Kipyego, 32, of Kenya hasn’t broken 2:16:54 in the marathon. He told us that was a result of injury and that he’s feeling much better about Monday. “I’m in better shape now than the last three marathons. I hope on Monday I’ll be back,” said Kipyego. When we asked him what his goal was, he looked at us like we were crazy. “To win,” said Kipyego, who has twice broken 2:07 in his career and has a 2:06:48 pb. Lonyangata was 9th in his only other Boston appearance (2014). We filmed our interaction with Mecheso, the former Oklahoma State product who is now living in New York and training under Mike Barnow, this afternoon and it’s embedded below. The 27:52 10,000 man, who has done a 30-miler in practice, seemed pretty confident and was full of ambition when talking about Monday’s race. He said he wants to break 2:10. When we pointed out that it was likely to be hot and that might make that goal tough, Mecheso got excited as get this – he loves hot weather. The obvious question we had for former Georgia runner Ian Burrell, who has a 2:13:26 pb from 2014 Houston, was why is he running Boston after skipping the Olympic Trials? 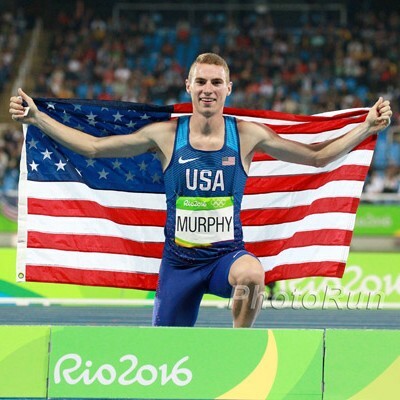 He said that he’s in Boston because he retired from the sport after last year’s World Champs (where he was 25th). He said he’d done the Trials in 2012 and that he wanted to focus on his law career and family (he’s married and has a young daughter). 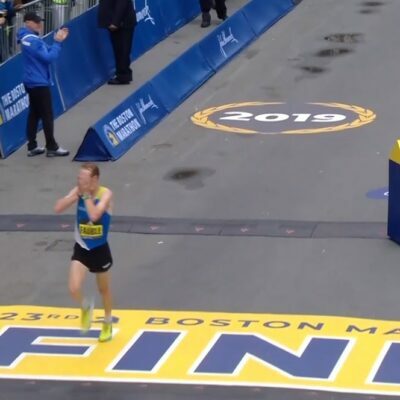 However, his agent Dan Lilot called him and asked him if he’d consider getting back in the game and committing to Boston as Boston wanted to get a few talented Americans on the start line. Burrell, who is a practicing attorney and partner in Colorado Springs, agreed and here he is. Our interview with Burrell, who also very much wants hot weather, appears below. A top 10 showing is his goal. If you are worried that 26-year-old Spence Gracey is going to be overcome with pressure on Monday as her father Steve Spence was both an Olympic marathoner and World Championship medallist (bronze 1991) and Spence was born in 1990 on the same day her dad was ran the Boston Marathon, you’d be wrong. Spence Gracey has a long-term plan that she hopes will make her an Olympian in 2020. For her first marathon, her first goal is to finish (so she can call herself a marathoner) and then to make sure she beats her dad’s best Boston finish (19th).